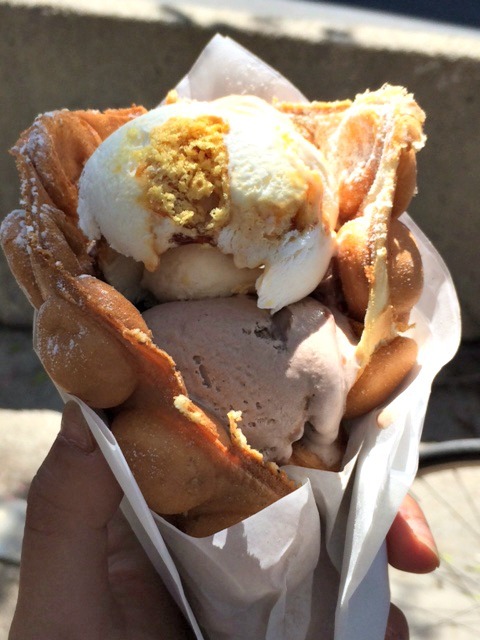 Well, it’s time to scream for ice cream and here’s my rundown on the best places in Toronto to get your summer fix. Opened just before last Labor Day, Sweet Jesus has been superstylin’ soft serve with everything from cotton candy to brownies. The Campfire S’mores, Lemon Coconut cream pie are true to their name. The Sweet Baby Jesus is chocolaty, nutty with peanut butter and warm fudge. Sweet Jesus is on John St. at the back of La Carnita. While the entrance is tucked away in the corner you can’t miss the long queue of customers. The service is fast so you won’t wait long for your ice cream salvation. My next stop was Bang Bang Ice Cream on 93 Ossington St. just above King. 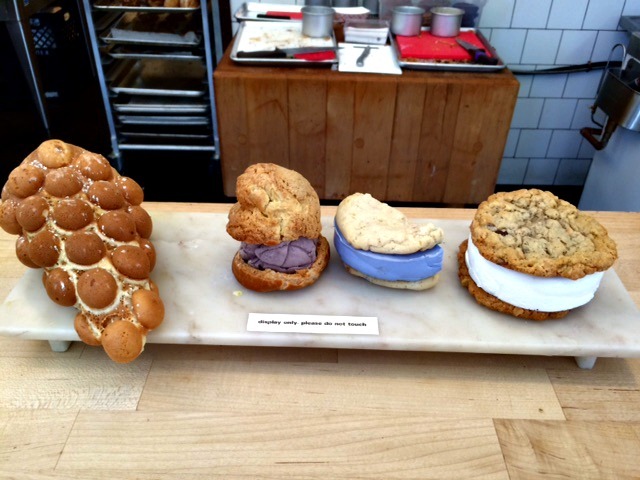 At the door you’ll find the chalkboard with instructions – pick your edible container, whether it be a waffle, chou paste shell or cookies (full or half) and order your ice creams. A huge choice of homemade, handmade funky flavours are listed on buckets on the wall. From Banana Pudding to lychee to Ginger Milk, there’s a quirky flavour for everyone. The enormous waffle cone will hold two gigantic scoops of ice cream, so my decision was made. The waffle is made fresh and takes a few minutes. I filled mine with a scoop of Burnt Toffee and Maltease Me. 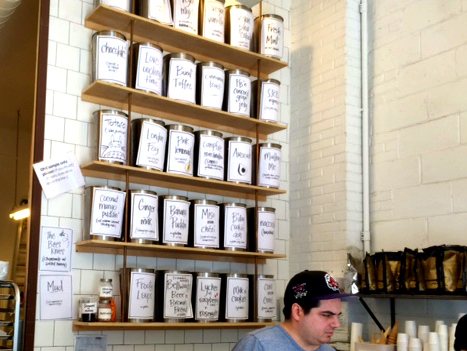 To lighten my calorie intake, I visited Grk Yrkt – read Greek yogurt in Kensington Market. A tiny shop at 291 Augusta Ave. serves up sweet and savoury toppings on your choice of fresh or frozen yogurt. A simple menu include some savoury choices like the Market which is cucumber, sundried tomato and toasted super seeds. I love peaches and the Beach Party seemed a good cool down to a very hot and humid day in Toronto. 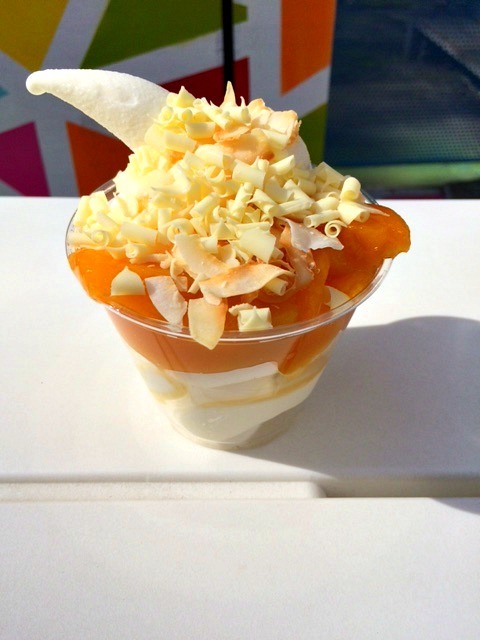 The combination of fresh, not too sweet peach preserves, toasted coconut and white chocolate is satisfying. I’ve not been a great fan of fro’ yo’ in the past, but this real version has made me a devotee to this tiny shop on Augusta. These handcrafted frozen treat shops are offering unique choices for you to cool down this summer. I will continue to support their efforts by making as many trips back as I can! Do you have a favourite frozen treat shop you’d like to mention? Let me know. Bon appetit, friends! They all look delicious and now I’m craving some!